The Penn State Student Chapter continued to prove why they are one of the top Student Chapters in the country! 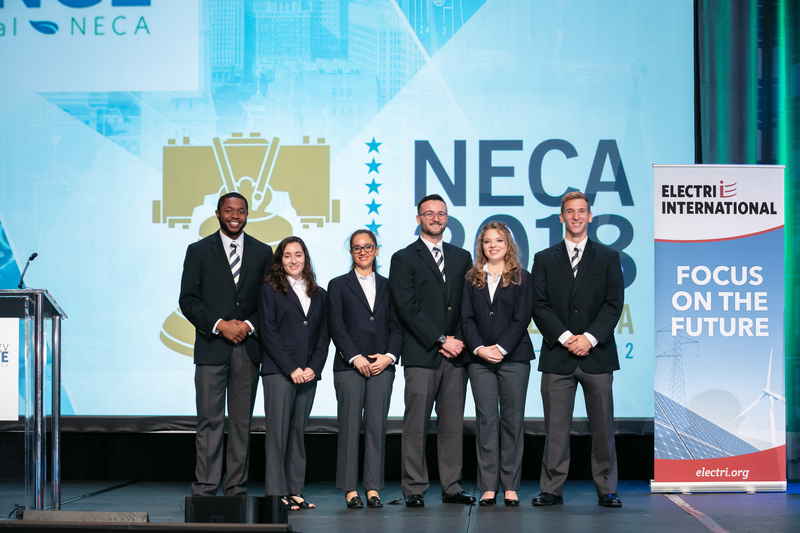 The Students once again made it to the finals of Electri’s Green Energy Challenge and on Saturday, September 30th they presented their Green Energy project to a judging panel made up of electrical contractors and industry partners at the NECA Convention. The other finalists included Iowa State and Illinois Institute of Technology. 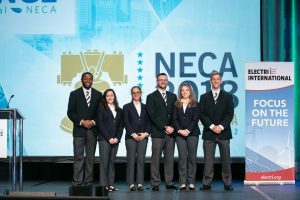 For their project, the Penn State Students Team developed a comprehensive and detailed analysis of the Police Athletic League Cozen Center and a cost proposal to convert the building into a net zero facility. The Team did an amazing job in putting together this proposal and their presentation was clear and concise. In the end, the Team fell just short and was runner-up to a tough Iowa State Team. However, one of the Penn State Students, Liam Cummings, claimed the Top Individual Presenter Award! A special thanks to Penn State University Student Chapter Faculty Advisors Dr. Somayeh Asadi and Dr. David Riley, Helen Levins and Joelle Salerno of the Western PA NECA Chapter, as well as Mark Stutman of Penn State University, Ryan Holleran of H. B. Frazer Co., and Jeff Simpson of Riggs Distler and Co., Inc. for their professional assistance.